Autumn is normally a time of increasingly active and interesting weather in the Northwest. However, such was not the case in 2013. Paradoxically, most of the autumn's interesting weather happened in September. The September 28 to 30 superstorm was the strongest weather system of the autumn season, and was more reminiscent of November than September. Winds gusted to over 70 mph in eastern Washington, and more than one foot of snow fell at Mt. Rainier, while the Olympia area received nearly 3 inches of rain on September 28th alone. Remarkably, much of western Washington was wetter in September than in October and November combined, and some locales received almost as much rain during the three-day superstorm as they recorded for the subsequent two months of the autumn season. Earlier in the month, an unusual, late-season severe weather outbreak occurred in central Washington. The strong thunderstorms on the evening of September 15th produced very heavy rainfall and winds of 60 mph on a day that recorded the latest occurrence of a 100-degree temperature ever in the AWN network. September was also notable because of the mild low temperatures, which were by far the warmest on record at Prosser (WSU IAREC). By contrast, October was meteorologically uneventful, and boasted a long stretch of dry and calm weather during the middle of the month. Although western areas were mired in low clouds for much of the time, eastern areas were mainly sunny and pleasant from October 13th to 26th. Another consequence of the relatively inactive weather was the cool overnight conditions that resulted from the clear and stable nights. 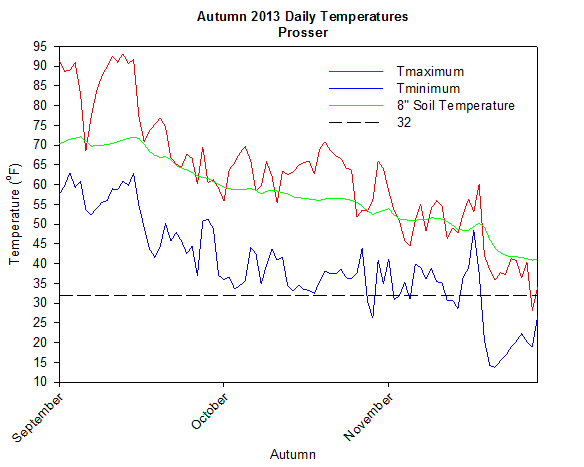 In fact, October ended the string of more than a year of above average temperature months at Prosser. Highlights of the month included a high of only 46 degrees at Crane, and 0.91 inches of rainfall at Tokeland on October 2nd. On October 28th, an unusual wind event from the northeast caused daily average winds of as high as 30 mph. 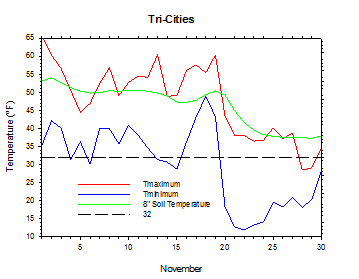 On October 30th, the newly arrived and very dry air allowed the temperature at Pullman to drop to its lowest level since January. November's weather was predominantly governed by two regimes. For the first 20 days of the month, conditions were mild and somewhat unsettled, and broadly resembled last November. However, a pattern change led to a cold and dry period for the final one-third of the month. Although the air mass was initially quite cold at all levels, conditions aloft moderated quickly. As a result, temperatures in the mountains were fairly mild for the final few days of November. However, as high pressure firmly established itself over the state, a developing inversion allowed the lowlands to lock in much of the cold for the remainder of the month. Highlights of November included a high of 64 degrees at Parker (near Yakima) on the 19th, and a low temperature of 7 degrees at Moxee on November 21st. Overall, Prosser's temperatures were below average for the second consecutive month, and followed a 15 month warm period. During the autumn season, temperatures were near to slightly below average, as a warm September served to balance a slightly cool October and November. In contrast to the unusual pattern of storm activity, temperatures followed a more traditional downward trend during the autumn. Very warm weather early in September gave way to notable cooling in the mid to late part of the month. 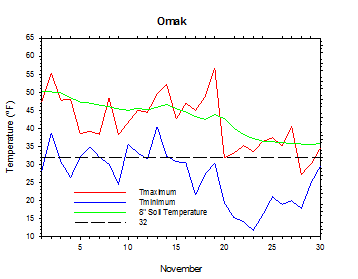 Thereafter, a slow cooling characterized a relatively stable two month period, which lasted until strong cooling occurred during mid to late November. November began with the approach of a low pressure system. Low temperatures on November 1st varied from the upper 20s to low 40s in the east, and 40s to around 50 degrees in the west. High temperatures on the 1st ranged from the mid to upper 60s in the sunny south to the mid to upper 40s in the cloudy north. A strong storm passed through Washington on the 2nd. Rain fell across the entire state, with more than one inch recorded in Whatcom County, while snow fell in the higher elevations. Average daily wind speeds were as strong as 25 mph at St. John. Lows on the 4th were as cold as 20 degrees, although many areas warmed to at least 50 degrees by afternoon. However, Garfield East (near the Idaho border) reached only 34 degrees. A weak storm brought some rain and snow on the night of the 4th. Long Beach received 0.53 inches by midnight, and rain continued in western Washington and also in the Tri-Cities area into the morning of the 5th. Meanwhile, snow fell in the Idaho border area. Wet weather again moved into Washington late on the evening of November 6th, with as much as 0.4 inches of rain falling before midnight in southwestern Washington. Additional rain on the 7th amounted to 1.15 inches at Montesano, with at least some rainfall everywhere in the network. Meanwhile, the high temperature climbed to 57 degrees at Mt. Vernon, but only to 36 degrees at Wenatchee Heights. Winds increased in the afternoon, and daily average speeds were as high as 16 mph at St. John. 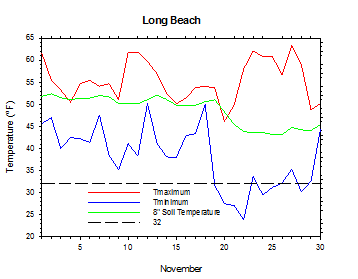 On November 10th, highs were mainly in the 40s and 50s, although Long Beach reached a balmy 62 degrees. Lows were in the 30s and 40s, as up to one-quarter inch of rain fell in north-central areas. 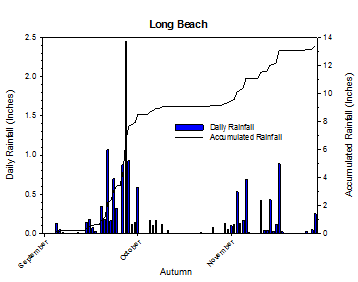 By the morning of the 12th, rain returned to southwestern areas, with as much as 0.42 inches recorded at Long Beach. Many areas were foggy on the 13th, which made for an interesting high temperature distribution. While sunny eastern areas topped out in the low 60s, foggy areas only climbed into the low 40s. Western areas uniformly topped out in the mid to upper 50s. A strong storm brought wind, rain, snow, and cooler temperatures on the 15th and 16th. Lows on the 15th were as cold as 23 degrees at Mabton East. Highs were in the upper 30s in the east, but warmed to the 40s and 50s elsewhere, with significant rainfall in western and parts of eastern Washington. 1.2 inches fell at Sakuma, while the Pullman area received up to one-half inch. Daily average wind speeds exceeded 20 mph in southeastern parts of the state. By November 17th, low temperatures ranged from the 20s in north central Washington to the 40s in southern areas, while highs varied from the 40s in northern areas to the 50s in southern/western regions. Up to three-quarters of an inch of rain fell in the Olympia area. Lows on the 18th were in the 40s to around 50 in many southern/western areas, but only in the mid to upper 20s in north central Washington. 1.5 inches of rain fell at Montesano, and wet weather was widespread in western Washington. More rain continued in the west on the morning of the 19th, with 0.3 to 0.4 inches in certain areas. Sustained southwesterly winds as strong as 31 mph were recorded at St. John. Much cooler and drier air flooded into Washington in the wake of the wet and mild storm, which began a prolonged period of calm weather across the state. On the heels of northerly winds, temperatures dropped as low as the teens on the morning of the 20th, with dew point temperatures as low as -10 degrees. Bright sunshine and dry air allowed highs to recover into the 40s in the southern and western parts of Washington, but only into the low 30s in north central Washington. 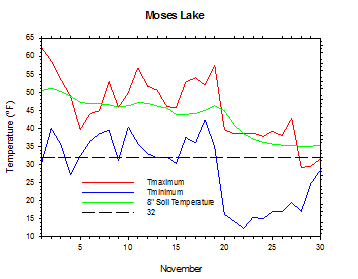 Lows on November 21st were as cold as 7 degrees at Moxee, with highs as chilly as 30 degrees at Anatone. Highs on the 23rd were mainly in the 30s to low 40s east of the Cascades, although Long Beach reached a pleasant 62 degrees. During this chilly and stagnant period, even western areas dropped into the 20s overnight. However, rapid warming in the mountains caused temperatures to rise into the 40s and 50s at places like Paradise, Mt. Rainier (elevation 5420 feet), even though lowland areas recorded overnight lows in the teens! Temperatures in the lowlands moderated on the 26th and 27th, with highs in the 40s around Pullman and 50s in much of western Washington. Much more active weather finally arrived to close out November. A potent storm entered the area on November 30th, and dumped upwards of three-quarters of an inch of rain in the Bellingham area. 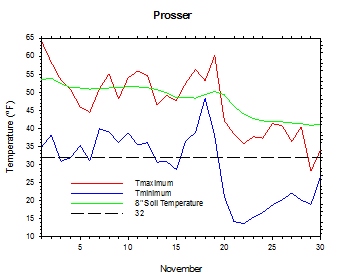 The average November temperature at Prosser (WSU IAREC) was 37.8°F, which is 2.1 degrees below average. The average high temperature was 47.1°F, which is 1.3 degrees below average. The average low temperature was 29.6°F, which is 2.5 degrees below average. The maximum temperature recorded last month was 64.0°F on November 1st, while the coolest daily high was 28.2°F on November 29th. Low temperatures ranged from 48.4°F on November 18th to 13.7°F on November 22nd. Daily average temperatures ranged from 51.3°F on the 19th to 23.8°F on the 22nd. The monthly precipitation total was 0.46 inches. The average wind speed was 3.8 mph, and the average 8 inch soil temperature was 48.0°F. 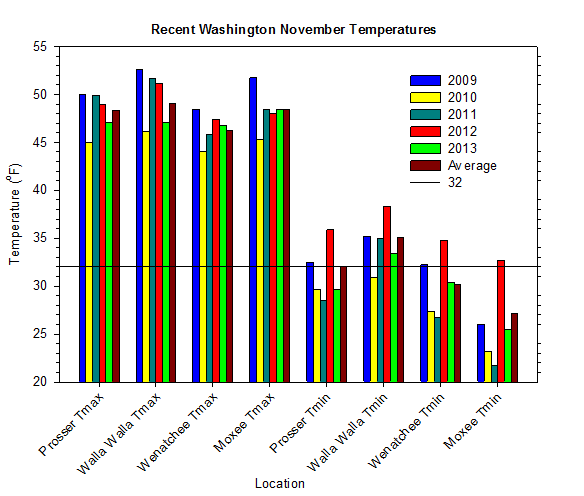 Wenatchee (WSU TFREC) recorded an average temperature of 37.6°F, which is about average, while Walla Walla's average monthly temperature of 39.6°F was 2.2 degrees below average. 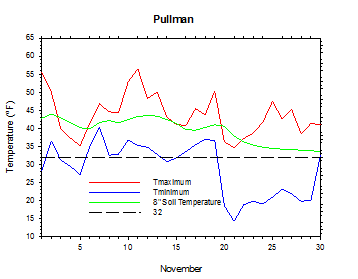 Pullman was one of the cooler spots in eastern Washington, with an average November temperature of 36.0°F. In western Washington, Mt. Vernon's average temperature was 43.7°F, which is 1.0 degrees below average. November 15th: 1.2 inches of rain fell at Sakuma. November 21st: The low temperature at Moxee plummeted to 7 degrees. 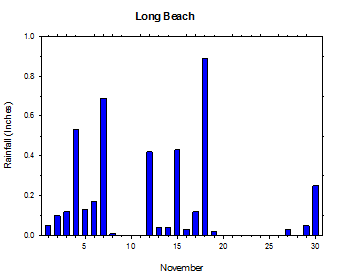 November 23rd: The high temperature at Long Beach reached a balmy 62 degrees. September was a unique and unusual weather month in Washington. Due to the combination of hot and humid conditions early, as well as cloudy conditions later in the month, September mean low temperatures were well above average. By contrast, high temperatures were near to slightly below average. In fact, Prosser shattered their previous record warm September low by nearly one degree. The premiere weather event of the month was the September 28 to 30 superstorm that brought heavy rain, heavy snow, and high winds to Washington. The winter-like storm system brought 5 inches of rain to East Olympia during the final three days of the month, while winds in eastern Washington gusted up to 71 mph, and over a foot of snow fell at Mt. Rainier. Earlier in the month, the temperature had soared to 101 degrees at College Place, near Walla Walla, on September 15th. Later that evening, with warm and unstable air in place, a severe weather outbreak moved through central Washington. Some areas received 15 minute rainfall totals of around one inch, while 60 mph winds flattened some corn fields. By contrast, October was a rather benign month. 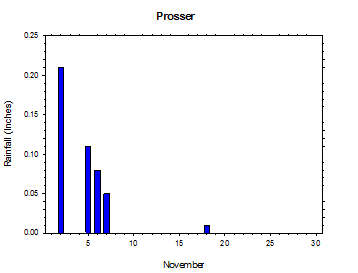 It was notable, however, that October ended a long streak of warmer than average months at Prosser. Despite slightly unsettled conditions early and late in the month, a long period of dry and calm weather highlighted the middle to latter part of October. Although western areas were mired in fog and low clouds for much of the time, sunny and pleasant days were observed east of the Cascades. Overall, monthly high temperatures were around average, while low temperatures were below average due to the generally dry and clear conditions. Interesting weather events for the month included a high temperature of only 46 degrees at Crane on the 2nd, and a daily rain total of 0.91 inches at Tokeland. On October 28th, strong northeasterly winds plowed through the state. Daily average wind speeds were as high as 30 mph at St. John. 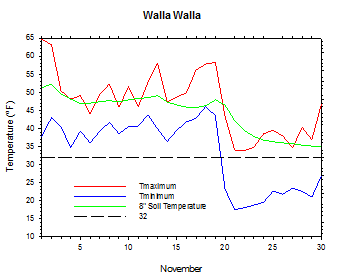 Dry air that followed the wind storm allowed Pullman to plummet to 17 degrees on October 30th, which was at the time their coldest reading since January. 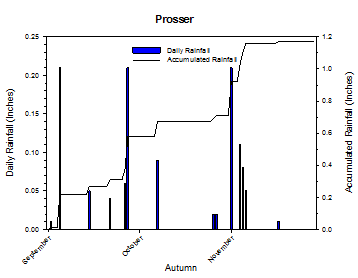 The average autumn temperature at Prosser (WSU IAREC) was 50.3°F, which is 0.6 degrees below average. The average high temperature was 62.7°F, which is 0.5 degrees below average, while the average low temperature was 39.5°F, which is 0.2 degrees below average. Daily high temperatures ranged from 93.2°F on September 13th to 28.2°F on November 29th. 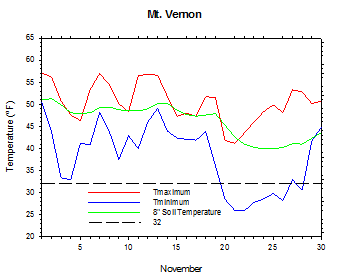 Low temperatures varied from 63.1°F on September 3rd to 13.7°F on November 22nd. Daily average temperatures ranged from 75.2°F on September 13th to 23.8°F on November 22nd. 1.17 inches of rain fell during the autumn season. The average wind speed was 4.1 mph, while the average 8 inch soil temperature was 57.7°F. Other locations also experienced near normal autumn temperatures. 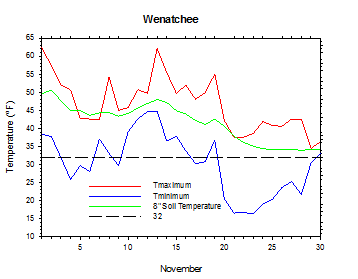 Wenatchee (WSU TFREC) had an average seasonal temperature of 50.4°F, which is 0.3 degrees above average. 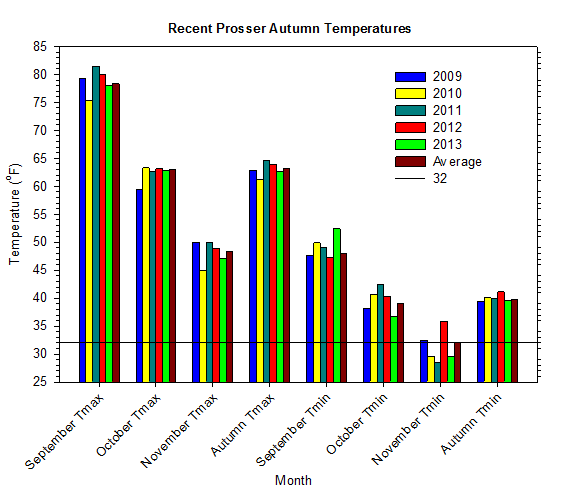 Overall, the autumn of 2013 was 1.7 degrees cooler than last autumn at Prosser (WSU IAREC). September 15th: The temperature soared to 101 degrees at College Place. September 28th: 2.85 inches of rain fell at East Olympia. October 29th: The temperature at Moxee dropped to 19 degrees. November 18th: 1.5 inches of rain fell at Montesano. September: Active and very warm, especially at night. October: Slightly cooler than average. November: Dry and slightly cooler than average. The growing season came to a close in November, as mild conditions early on transitioned to cool weather late in the month. Apple and potato harvests were completed early in the month in central Washington. The dry and benign weather of late November was ideal for Christmas tree harvest, as winter wheat was expected to enter dormancy. Otherwise, dry corn harvest was completed in Grant County, while central Washington orchards continued with clean-up activities (National Agricultural Statistics Service). 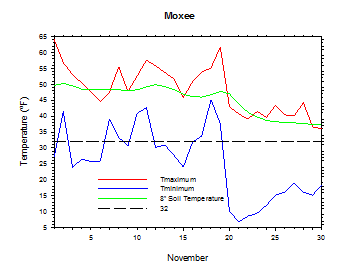 On November 24, 2010, the low temperature at Moxee plunged to -17 degrees. According to the Climate Prediction Center (CPC), near average temperatures and precipitation are expected during the winter season. ENSO Neutral conditions are likely during the winter, with a trend toward El Niño as 2014 progresses.